No question. But then that’s precisely the point. If you’ve long yearned for the perfect illustration of the timeless adage having to do with “the straw that breaks the camel’s back” you need look no further. Nothing is without a breaking point. Sometimes it need only be something the weight of a feather that brings the fall to fruition. 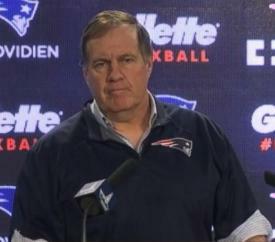 So it is with Bill Belichick, who played with fire for 15 years and finally got burned. He takes his Patriots with him, but, then, they are willing accomplices. Necessarily, we have deadlines in this business. So this is written at the beginning of Soupey Week, a few days before the Big Bombast in the Desert, and in that interval more may be revealed and the grand poohbahs of the National Football League may even act, although it is hideously clear they are hugely reluctant and may even dissolve into silly putty at the prospect. A fast resolution is probably unlikely. But sooner or later the mess will get sorted out, although what they do or don’t do will probably matter little while changing nothing and leaving few satisfied. The verdict has already been delivered. The damage is done. The die is cast. The Patriots can win the game. They are surely good enough, at least on the field. But their cause has been lost. And that loss is irrevocable. Call it “silly” all you wish, but a chord has been struck and there’s no way it can get un-struck. “Deflategate” was the lead story on back-to-back evenings on the CBS network’s national news, the industry’s gold standard. It continues to ride the front pages of the nation’s most prominent newspapers. On Saturday Night Live – like it or not, the popular arbiter of the nation’s more sarcastic cultural whims – the lead skit cast brothers Belichick and Brady as perfect idiots. That it should come to this is pathetic. The supreme irony of this ongoing super-fiasco is that of all the contretemps Mr. Belichick has ensnared himself over the years, this is the one in which he is probably least guilty. One can accept his fundamental argument – which he’s been offering with an uncommon reticence – that he has much too much to do and ponder and fret about as he leads his team onto the field and through a game than to spare a nano-second worrying about how much air per square inch has been pumped into his footballs. I buy that argument. It makes sense. Which does not mean I believe he’s been telling the truth, the whole truth, and nothing but the truth. As is his way, Belichick pushes the envelope too far when he further asserts he had no idea there was any controversy about the game balls in the Colts tilt until the next morning. The tens of millions of us watching the game on the telly knew something was up in the third period when the officials pulled a ball from play right under Coach Belichick’s nose. TV caught it clearly and the announcers were sharp enough to jump on it and point out that indeed, something was “up” with the ball. There’s no way nobody on the sideline – from the foremost of the players to the least of the gofers – recognized something was happening and what one of them knows, the coach knows. You can take that to the bank. Maybe it’s just his bad fortune but Belichick has a way of straining his credibility and when you flub little details you leave a gaping hole in your line of defense through which a ballerina could waltz for a touchdown. He has done it again. Methinks the coach must be kicking himself for he doubtless now realizes he could have greatly defused the issue near the get-go. It was in his first go-round with the media, the one in which he categorically dismissed any and all responsibility, essentially dumping the entire problem in his favorite quarterback’s lap. That strategy was dumb, something you can rarely say about Mr. Belichick. Instead, it would have been so easy for him to have taken the high road and invoke the now classic and usually very effective pose that while he believes he personally did nothing wrong he, as coach of the team, captain of the ship, and the man in the catbird seat where the buck must always stop, willingly accepts all the blame, period. It would have worked wonderfully in this scenario, methinks, and because the issue is a bit of a trifle it would have, however begrudgingly, likely brought about a cease-fire. Sure, the quibbling over the little details would have continued. The vast legions west of Worcester and south of Hartford who dislike him and his team so intensely would have had yet another ax to grind. More of the bloom would have been off the rose. But the damage would have been limited. The give and take would have mainly just added spice to Soupey Week. Even we critics who’ve long agonized over his childish duplicities might have been appeased, or at least silenced. And the coach himself may have emerged from the hassle looking rather more noble than usual, assuming he’d been able to play the role convincingly and, given his skills, nothing would surprise me. Instead, he squinted and squirmed and passed the buck. In the end, Bill Belichick is paying a heavy price, but it’s only incidentally about the so-called “Deflategate.” It’s about too many people in the game devoutly believing he and his Patriots have committed a long train of abuses; some of them verified, and even admitted, others alleged but never proven, still more merely rumored in what is being termed “a culture of cheating.” In the end, it’s about a mere feather alighting and proving to be the straw that might break the camel’s back. It’s all rooted in when Mr. Belichick first came to the Patriots after ditching the Jets in a way many disapproved. In St. Louis, they still believe he spied on the Rams’ pre-Soupey preps the year they first won it all. Panthers’ ex-GM Marty Hurney now claims his team’s practices were taped in Houston en route to the Pats’ next Soupey triumph two years later. There was also, of course. “Spygate,” for which many football folks feel he should have been suspended a full year, and the case of the purloined Jets playbook, and the alleged wiretaps, and repeated monkeyshines with the Gillette Stadium communication systems, and the misleading injury reports game after game and year after year. This is only a partial list of the complaints; some petty, admittedly, but some truly troublesome. Today, he has the Rooneys in Pittsburgh, high among the game’s most respected clans, annoyed with him over this year’s LaGarrette Blount capers. Many are still grumbling over the substitution schemes he got away with against the Ravens, which likely saved his season, with critics maintaining he once again arrogantly stretched the limits of sportsmanship. Meanwhile, we have the infinitely ugly Aaron Hernandez murder trial luridly on-going. Nobody in this game blames Belichick for Hernandez’s wretched works, but few are surprised this obvious bad actor flourished under Bill’s watch. How much of it is true? How much of it is valid? How much of it is legend? How much mere envy? What alone is beyond dispute is the fact that Bill Belichick’s capacity for plausible deniability has become so diminished even something as flimsy as "Deflategate” has the potential to destroy him, says Clark Booth.. Fascinating, is it not? Almost enough to make Soupey itself seem irrelevant.